Introduction: If ever an industry catered to the do-it-yourself, grass-roots, garage hobby gone mainstream syndrome, that would be the fishing industry and its wonderful world of baits. Whether that be making crankbaits or pouring soft plastics or tying one's own jigs and spinnerbaits, the garage bait companies have always been there. 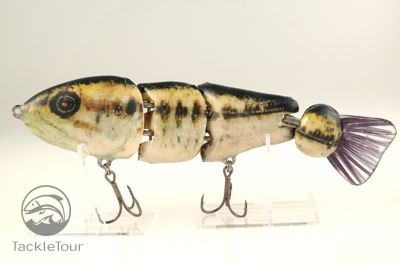 Enter the swimbait market where the demand for unique, big, and high dollar baits has been on the climb for the last several years. Today we take a look at one of the latest companies to hit the market, Orso Swimbait Company out of Oak View, California. Background: Dave Roberson and Rob Cummings, the founders of Orso Swimbait Company are true to the garage-bait company gone mainstream story. Dave, having been bitten by the big bait craze in Southern California back in 2004 soon found himself in the midst of a buying spree purchasing any big bait he cold find. This, of course, let to some of his own visions of what he wanted in a bait where he then enlisted his buddy Rob to help him make his vision into reality. 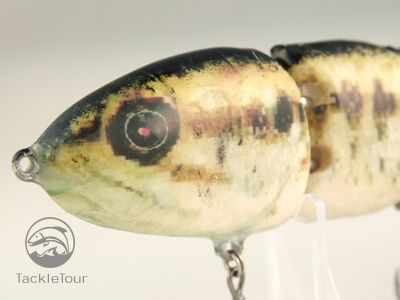 Through many prototypes, lost fish, and a growing list of friends wanting a copy of their eventual working masterpiece, Orso Swimbait Company was born and now, four years later, they have hit the market with their Split-tail baits. 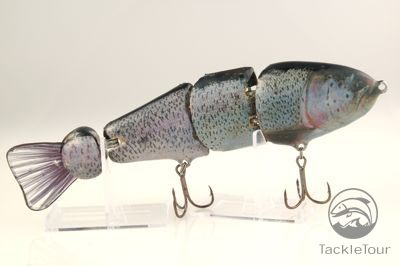 The Split-tail: At first glance, the Orso Split-tail is a prototypical trout profiled big bait. Upon close inspection however, one comes to realize the joint at the tail is different than other baits. As the name infers, this is the real business end of their baits. Here is the very large, 12" Split-tail in Amistad Shad. Built of a clear, hard plastic material, the tail is attached to a section of resin molded into almost a round ball. It is noticeably wider than the rest of the bait. This entire tail section is then attached to the main body via a single, multi-directional joint. The remaining joints all have two points of attachment to the next adjoining body section. Laying the bait on its side, you can see it is relatively thin but also, well articulated. The photo-finish of the Amistad Shad. 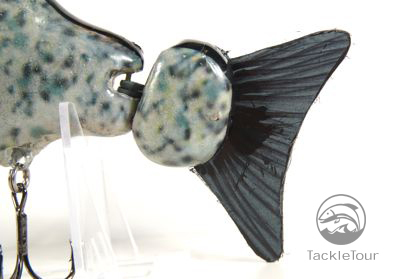 In the water, it is this special tail section that takes on a life and action all it's own and is most noticeable on the floating version of these baits. The wake created by these extra large, and extra wide tails is extraordinary and you can really feel the fish attracting potential of these baits while watching them swim back to you in the water. The business end of these baits and the oversized tail together with the round, ball-like body section to which the tail is secured. 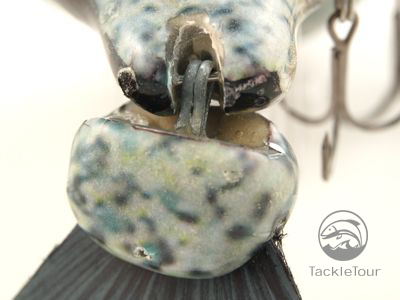 Every bait is covered with a thick, clear layer of epoxy. Even more extraordinary than the action of the Split-tail's rear appendage are the available sizes for this bait in eight, twelve, and soon to be sixteen inches! Dave reports that during development they noticed the larger, twelve inch prototypes attracted even more bites than their eight inch starter baits! 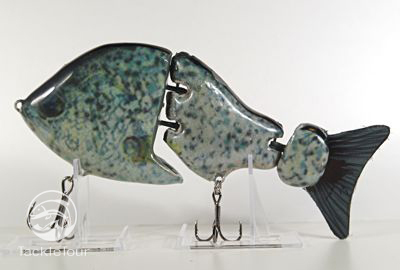 Orso's take on the sunfish profile - their Gill-Zilla in Crappie. Gill-Zilla: True to a manufacturer's survival technique, Orso Swimbait Company is not blind to the current trends in the big bait market either. 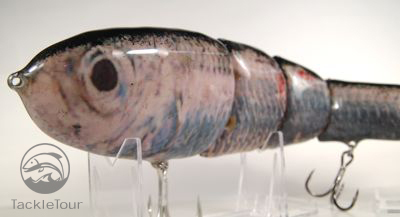 Spawned by the popularity of such baits as Black Dog Bait Company's Shellcracker, Orso also has, as part of their offering, a sunfish profiled bait called the Gill-Zilla. We thought BDB's Shellcracker was a big bait. Check out the size comparison with the Gill-Zilla! The Gill-Zilla's tail is shaped differently than that of the trout profile split-tail. 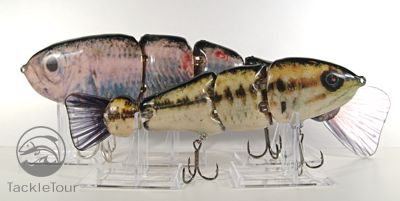 Borrowing a queue from their twelve and soon to be released sixteen inch original Split-tail, Orso says bigger is better introducing their Gill-Zilla at a whopping seven inches and five point four ounces! 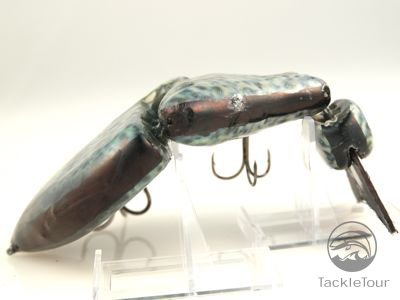 It shares the signature Split-tail design of Orso's original bait but is made in only a sinking version at the current time. It is one very serious bait to say the least. Despite it's large profile, the Gill-Zilla i still rather slender from up top. Availability: Orso's baits are available right now straight from their website or through retailers such as Outdoor Pro Shop dot com. They have some new sizes and colors planned for launch around the time of the annual Bass-a-thon in Southern California. 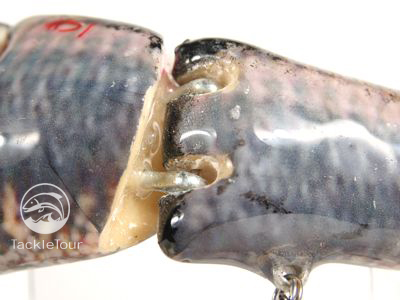 The single joint holding the tail section of these baits to the main body. Conclusion: We've had the opportunity to throw these baits in the water a couple of times but haven't had the chance to fish them consistently just yet. Initial impressions are these baits are worthy of further investigation and our full review is still in the works. 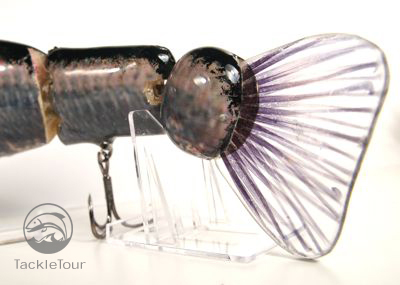 In the meantime, we felt it important to get this producTTpreview up to help those who may have been on the fence regarding these baits pending more photographs and information. Stay tuned for more information about this upstart manufacturer, their new products, and our full review in the coming months.